The Vista Series blurs the line between the world of fine art and the art of advanced acoustic guitar building. One can expect high-level craftsmanship and rich, warm sound, Luna acoustics have long been sought after for their remarkable aesthetics. 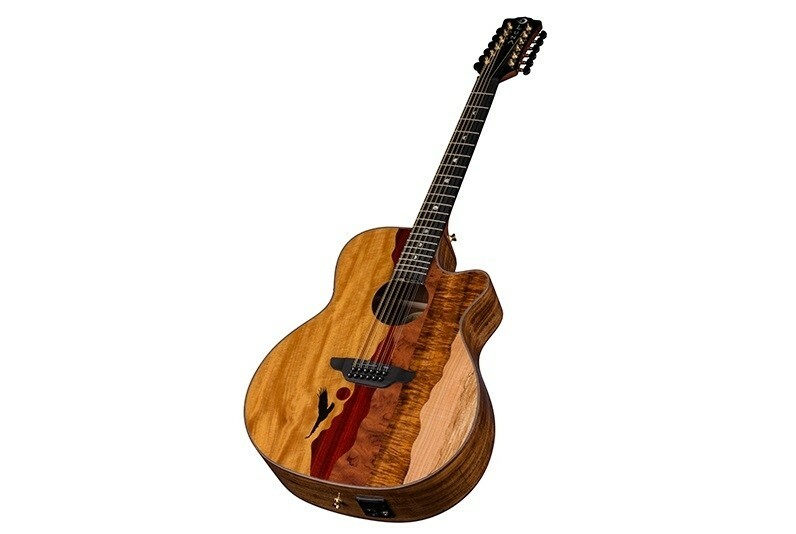 The Luna Vista Eagle 12 String showcases a skillfully crafted top, made from attractive tone-woods that bring its unique panoramic image to life. Handmade from a combination that includes Movingal, Paduk, Quilted Mahogany, Koa and Spalted Maple, each guitar is a completely unique work of art. This Vista Eagle features a gloss finished, flamed maple bound, Grand Concert body with choice Koa back and sides for enhanced tone and projection. Precision fitted with a hand-shaped 25 scale Mahogany neck and capped with a smooth, Pearl Moon Phase inlaid Ebony fretboard the Vista Eagles feel, playability, and stand-alone acoustic sound are nothing short of inspirational. Once plugged in, the Vista Eagle takes off in yet another sonic direction. Owing to a Fishman Presys+ 201 preamp/tuner and Fishman Sonicore pickup, the Vista Eagle offers clear, strong, natural acoustic sound on stage even when going against dense instrumentation. Whether plugged-in or not, the Vista series incredibly full tone, pristine clarity, and unique visual presence make it the ideal instrument to make your musical statement.